Today I’m going to show you how I made Tater’s trunks from the Beach Bums look. They really weren’t that hard. The hardest part was figuring out the fabric. I got the print microfiber from The Fabric Fairy, and the blue is nylon taffeta from Hancock Fabrics. The mesh liner on the inside is also from Hancock Fabrics. 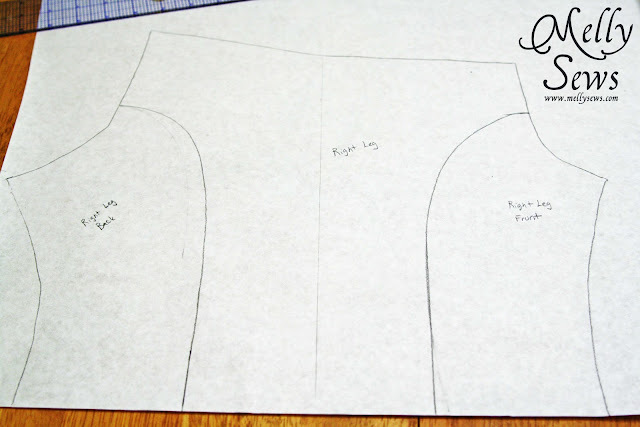 I started with a one-piece pants pattern (if you don’t have one you can make one following the directions here). I traced the pattern onto my paper, then sketched in the curves for the right leg. And then I stopped taking pictures (sorry!) 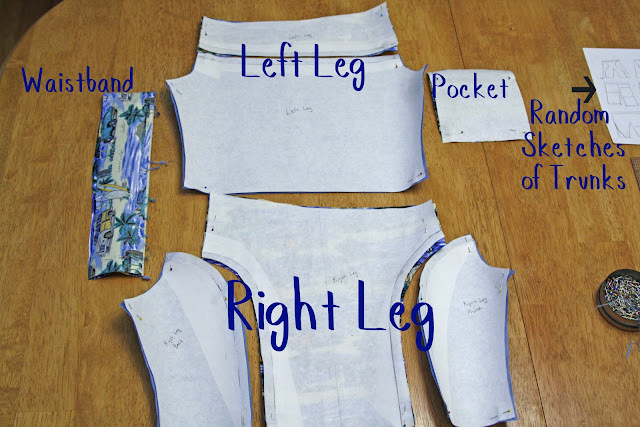 I sewed the pieces of the right leg together, then the pieces of the left leg. Then I sewed the pocket on the left leg, and from that point on sewed them together like normal shorts. For that I traced the liners from Tater’s old trunks as a pattern, adding in an inch to the legs to make a casing. I encased elastic on the leg openings, then basted the top of the liner to the top edge of the trunks before attaching the waistband. I also topstitched the seams flat with contrasting thread as I went along. And there’s a stylish (and functional) pair of trunks if I do say so myself! Fantastic! Why ever buy clothes again? SUPER cool!! Thanks for sharing how you did them. 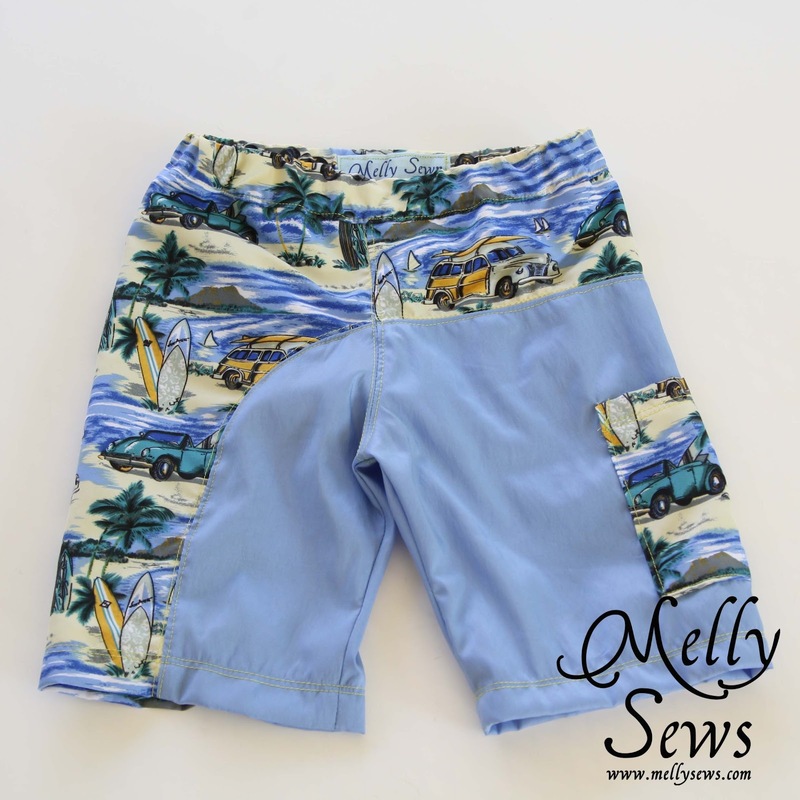 It is details like this that make sewing for boys fun. This is such a great idea,thanks for sharing! I WOULD LOVE TO TRY SOMETHING LIKE THIS. Love it! Definitely going to try this for my 7 year old boy! 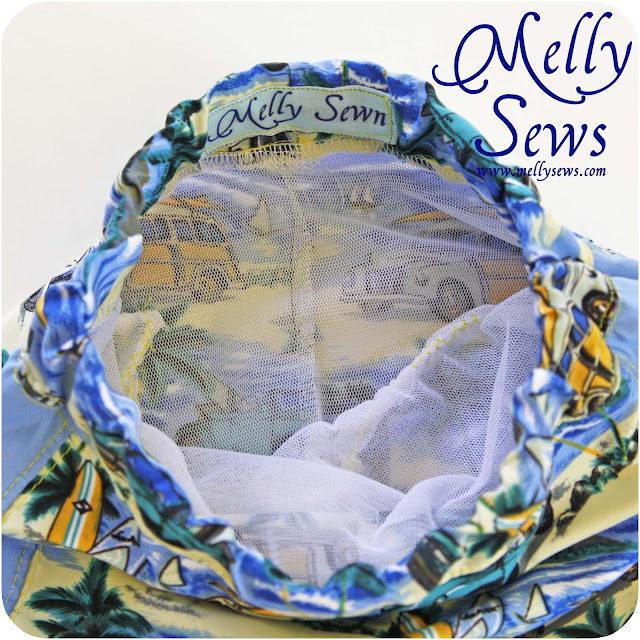 This is a great idea and I love how this swim suit has such eye-appeal with the different fabrics. Thanks for sharing! This is awesome,you have great talent! These would look so cute as ordinary shorts too! Very nice! 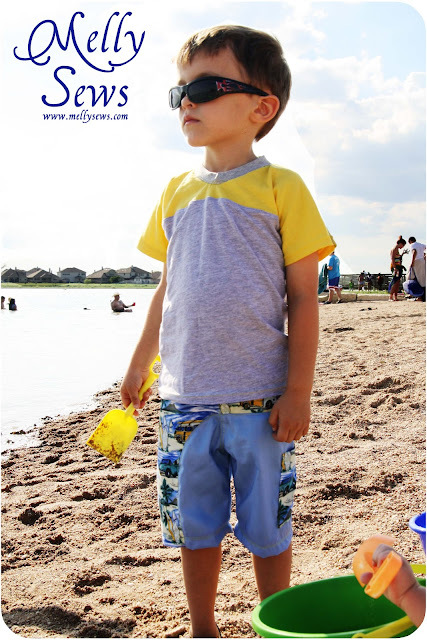 This reminded me to check on my kids swimming clothes, I might have to make my son something similar. These are so cute. I’m going to have to try some for my boys! Thanks for the Tutorial! I love the fabric that you chose! And the detailed stitching?! Awesome! I’ve pinned this project 🙂 I’m looking for guest posters during SHORTS WEEK on my blog ~ I would love to have you!!! Swing by tomorrow for more deets 🙂 Thanks for sharing your talent! love it! amazing. featuring you tonight! 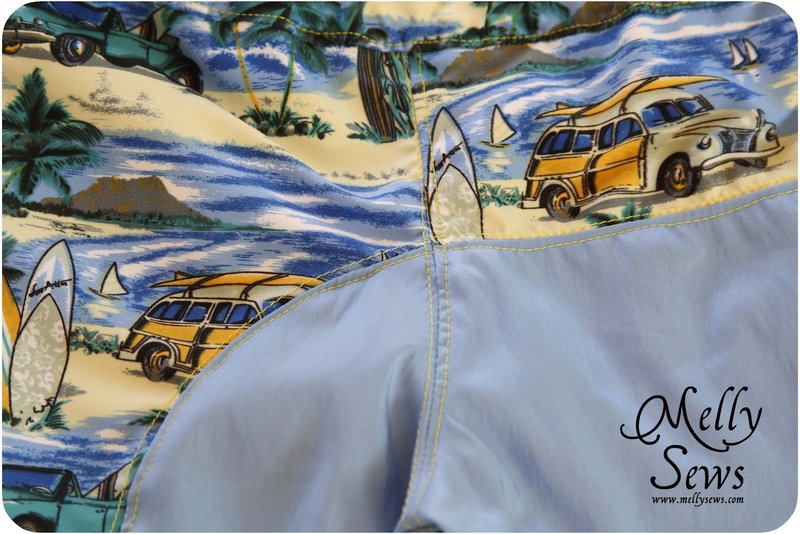 What a slick pair of trunks. Perfect selection of fabric. Love the double top-stitching. Gives it a real professional finish.